(CNSNews.com) - With the close of business today, the period in which Congress suspended any legal limit on the federal debt expires and as of tomorrow the limit on the federal debt will be set at whatever the level of debt happens to be. As of Nov. 2, 2015, the federal debt subject to the legal limit stood at $18,452,108,000,000. As of the close of business on Tuesday, the latest day reported, it stood at $19,865,505,000,000. That means the federal debt increased by $1,414,397,000,000 during the approximately 16 and a half months that Congress removed any legal limit on it. “Congress has modified the debt limit 14 times since 2001,” the Congressional Research Service reported in October 2015—a month before Congress modified the debt limit for a 15th time since 2001 by including the language in the Bipartisan Budget Act suspending it. By suspending the debt limit from Nov. 2, 2015 through March 15, 2017, Congress and President Obama gave the Treasury the authority to borrow an unlimited amount of money from Nov. 2, 2015 until after the 2016 election. On Oct. 3, 2008, President George W. Bush signed “The Emergency Economic Stabilization Act,” creating the Troubled Asset Relief Program that authorized the Treasury Secretary to purchase up to $700 billion in assets from troubled financial institutions. That law also increased the debt limit from $10,615,000,000,000 to $11,315,000,000,000. 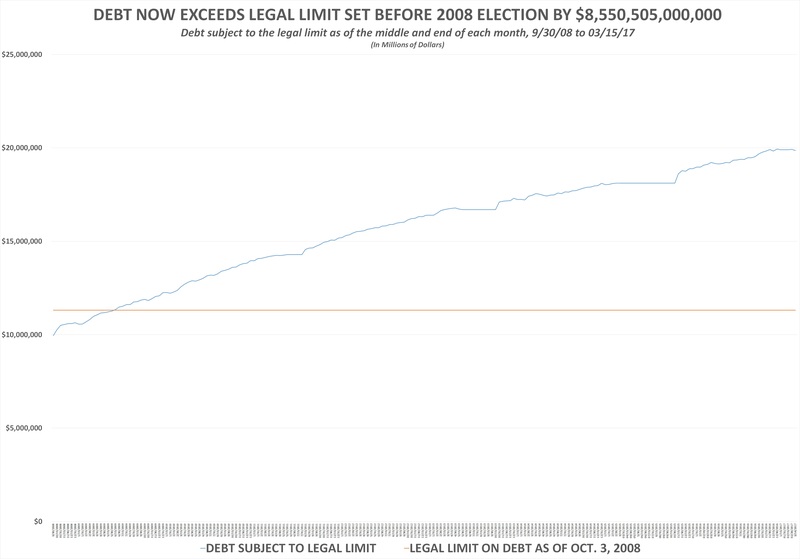 That was the last debt limit increase before the 2008 presidential election. Since then, borrowing by the federal government has increased the federal debt subject to the legal limit to the current $19,865,505,000,000—which exceeds the October 2008 limit by $8,550,505,000,000. Treasury Secretary Steven Mnuchin sent a letter to House Speaker Paul Ryan last Wednesday reminding him that the suspension of the debt limit would end today. “As you know,” Mnuchin wrote, “the Bipartisan Budget Act of 2015 suspended the statutory debt limit through Wednesday, March 15, 2017. Beginning on Thursday, March 16, 2017, the outstanding debt of the United States will be at the statutory limit. When the debt hits the limit and Congress and the president do not immediately enact new legislation to increase it or suspend it, the Treasury typically engages in what it calls “extraordinary measures” to keep the debt at a constant level just below the debt ceiling. In 2015, for example, as reported on the Daily Treasury Statements, the Treasury froze the debt at $18,112,975,000,000 for 235 days--from March 13, 2015 until the Bipartisan Budget Act suspended the debt limit on Nov. 2, 2015. In his March 8 letter to Speaker Ryan, Secretary Mnuchin said that the Treasury would once again begin using “extraordinary measures” on March 15 to avoid the debt limit. Ironically, during the end of the period in which the debt limit was suspended the debt subject to the limit actually trended generally down. It peaked on Dec. 30, 2016 at $19,939,042,000,000. The $19,865,505,000,000 in debt subject to the limit as of the close of business Tuesday was $73,537,000,000 less than that.